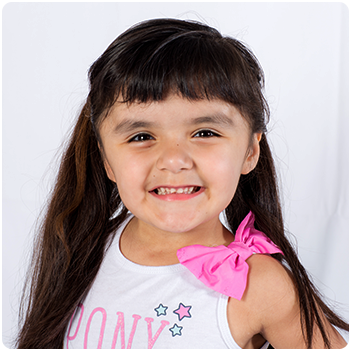 El Paso Children’s Hospital first diagnosed Andrea with craniosynostosis when she was four years old. It’s a condition that prevents the skull from growing to accommodate the brain and can lead to dangerous pressure on the eyes and base of the skull. The bottom line is, Andrea would have gone blind without treatment! Andrea has undergone two surgeries and several visits with doctors, but she is doing great, and doctors expect her to enjoy a normal life! For Andrea, this means playing fashion model or dreaming of becoming the world’s greatest mariachi singer!